Pre-heat your oven to 180c. Grease and line a 26cm spring form pan. Cut your plums and place them in a ceramic dish with the sugar, lemon juice and zest and the vanilla seeds. Toss to coat the plums with the sugar and lemon and then place in the oven. Bake for approximately 20 minutes and then remove from the heat. 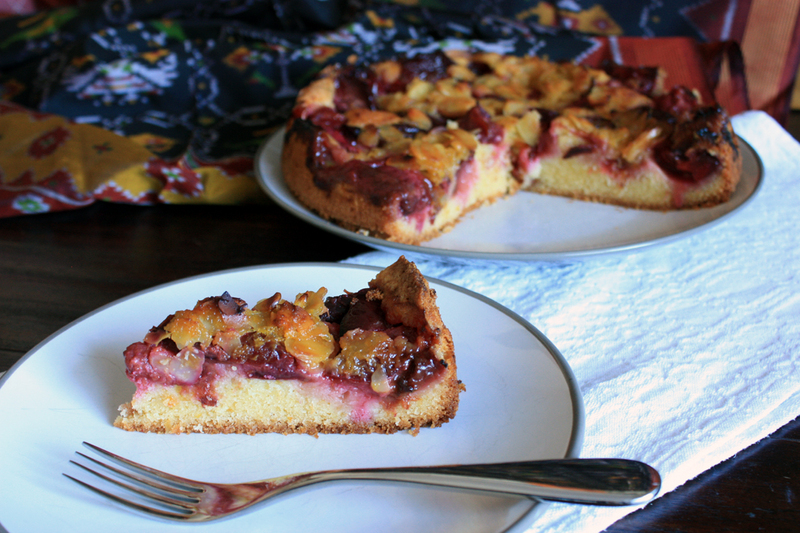 When your plums are cooked you can then start the cake. Cream your 150g of butter with the 150g of caster sugar until light and fluffy. Add your eggs in one at a time, combining well before adding in the next. In a separate bowl combine your flour, baking powder and almond meal, then add to your butter and egg mixture. Combine well. Your batter will be quite thick and only just cover the base of your baking tin with about a 1 1/2cm depth. Spoon the plums over the cake leaving aside the juice as much as possible. Bake the cake for approximately 30 minutes at 180c. At this time add the topping. To prepare it combine the orange juice and zest, the almonds, brown sugar and butter in a small saucepan. Place over a low heat and combine and cook until the butter has melted. Pour over the cooked cake. Don’t worry about the liquid that sits on top of the cake, this will reduce and intensify in flavour as it bakes and the batter is dense enough to carry it. Return the cake back to the oven for a further 30 minutes. Your almonds will look nice and toasted. Allow to cool and then remove from the pan. This cake is best served fresh with some double cream or marscapone cheese.